This week, I continued with simple sweeps from underneath. Previously I went through the toe grab sweep, so today I'm following up with what Gordo (the guy who effectively created the half guard as a viable position) calls 'Plan B'. I don't think that's very descriptive, so I prefer calling it whizzer counter roll. The situation is that you've managed to get the underhook under half guard, but they've threaded their arm through in what's called a 'whizzer'. That ruins your back take, but it doesn't stop you sweeping them. Indrek Reiland shows how you can still do the toe grab, or you can do a counter roll movement. 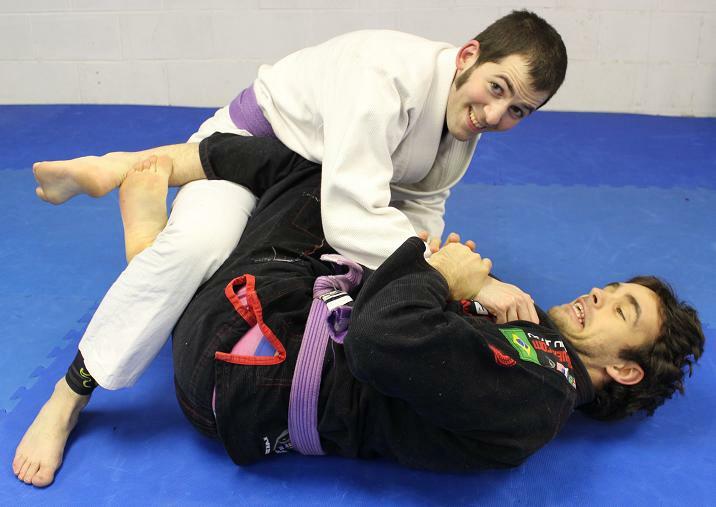 With your free hand, push their knee outwards to disrupt their base: you can also underhook that leg if you prefer. Dive your body underneath them, putting your head into the gap between their arm and their leg. Finally, bring your whizzered elbow back towards their head, aiming to clamp your elbow to your side (as much as you can in that position). From here you should be able to roll them over fairly easily. If you need some additional help, try tweaking their leg out like you do with the toe grab sweep. Teaching Notes: This is what I followed up with last time I taught half guard, but I'm not convinced it is the best follow up. I'm not sure many people even use the whizzer, something on which this sweep is predicated. So, unless I notice a bunch of people whizzering, I think next time I get to this stage in half guard month, I'll teach the kimura from half guard instead. Having said that, at least seemed everyone managed the mechanics without any issues, given this is not a complex sweep. You could argue that even if people aren't doing a lot of whizzering, it is good to pre-empt that control with this sweep. Or perhaps if I had a class on the basics of maintaining the top position in half guard it would come up? I'm going to run through two half guard passes next week: that might bring up some other useful points for me to keep in mind for the person on the bottom.